1 : In a saucepan, melt butter over medium heat. Add sugar and cook until mixture bubbles, about 2 minutes. Remove from heat. 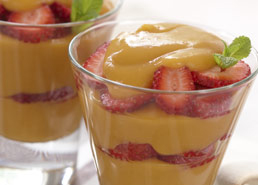 3 : To assemble desserts, in parfait or martini glasses, alternate layers of pudding and sliced fruit. 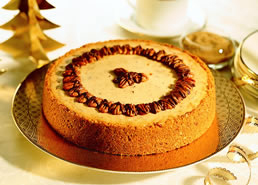 Serve immediately or assemble up to 3 hours earlier; cover and refrigerate. Garnish with mint sprigs. Pudding can be kept covered and refrigerated for up to one day.